1967 Scott Dillon Diamond Tail , Spoon Nose 8ft 11"
Foam blank with multi glue-line Stringers, Volan glassed. Post production leg rope plug. Deck: Concave/spooned nose, concave knee wells (shaped), chamfered pod. 11" x 6" base Flex fin . The fin was removed and reset forward, circa 1971 - 1980. See Board History and image below. This may not be the original fin. The fin was removed and reset in its original position February 2001. 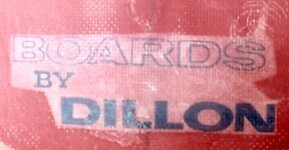 Bottom: 'BOARDS BY DILLON' black text at tail. Deck: ' 101 8' 10" ' pencil on tail. Board bought used, circa 1971 at Scout Hall Sale, Tasmania by Rodney Walters. Used as a paddleboard at Ulverstone Beach, NW Tasmania. At some stage Rodney moved the fin forward. In 1988 the board was brought to NSW by Stuart Walters (brother), who added the leg rope plug. 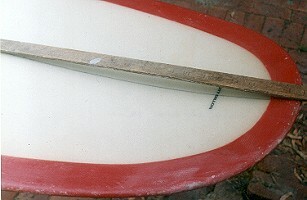 Minor repairs in Volan, fin removed and returned to original position by Geoff Cater, February 2001. The fin may not be original - note that the base was inserted into the blank at the first two settings and then cut off. A highly unusual board with many interesting features. The multi gluelines appear to form a Peace Sign, the application is for decor effect only. The round bottom is deep throughout the board and seems to approximate Vee bottom development mid 1967. The bottom decal is trimed from a larger decal reading "SURFBOARDS BY SCOTT DILLON". The number '101' is possibly significant - the start of a series? 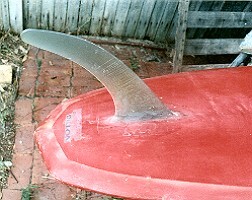 The concave/spoon nose, although a noted feature on several noseriding models manufactured in the USA at this period is unusual in Australian board. 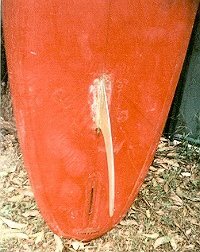 Its execution resembles George Greenough's knee board design, see Jackson Spoon and Backyard Spooned-Deck Kneeboard. Also note Nat Young/Gordon Woods Surfboards Cuttlefish, 1965 and Paul Witzig's board seen in Hot Generation 1967, Part 3. The knee wells, shaped into the board approximately 6'' long x 3'' wide x 1/4'' deep, are exceptional. The chamfered tail, both square and diamond, was a common feature of Vee bottom designs, mid 1967. See WM Vee Bottom, 1968. This feature and the fin (if original) indicate the probable manufactuing date. CONDITION: 8, non-original fin (?). fin repositioned. Second fin position - original position indicated by fin base still set in the blank.